Product Description: The mid-eighties saw a downsizing of vehicles and smaller lighter models were introduced. One of Jeep's innovations was to use unitary construction. They also gave their models many car characteristics. Early engines were nothing special but putting in the new 4-litre straight-six made a dramatic improvement while the Renault-sourced turbo diesel also helped in the European market. It was these strong sales that made Chrysler buy the Jeep name. 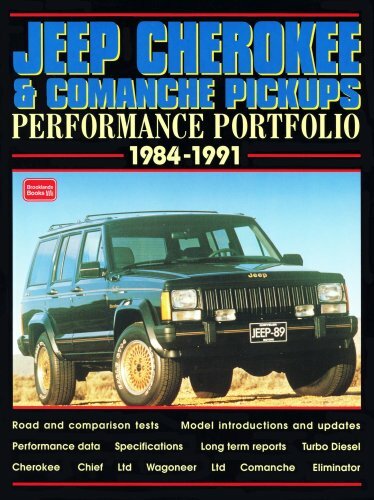 The Comanche trucks were cleverly marketed as stylish pick-ups. This is a book of contemporary road and comparison tests, technical and specification data, new model intro's, driver's impressions, long term reports and off-road tests. Models covered include: Cherokee, Cherokee Chief, Wagoneer Limited, XJ Jeep, Cherokee Limited, Turbo Diesel, Comanche, Comanche Chief.